Tia Keyes is professor of physical chemistry at the School of Chemical Sciences, where she has been a member of academic staff since 2002. Tia’s research team are based between the School of Chemical Sciences and the National Biophotonics and Imaging Platform Ireland (NBIPI) a multi-institutional initiative established under PRTLI which Tia has led since 2009. 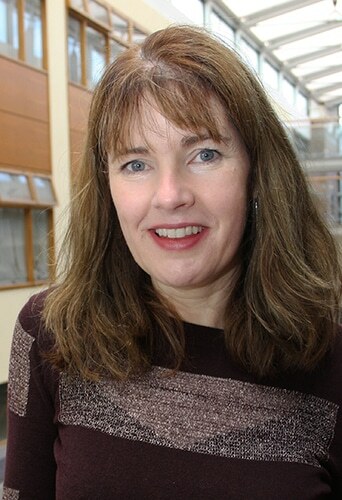 Tia was an academic member of The Biomedical Diagnostics Institute and co-node leader (Britain and Ireland) on the Biophotonics4life consortium. She is author/coauthor of over 165 peer-reviewed publications in international journals. Her groups work has featured as 9 journal covers and highlights over the past 6 years. The Keyes group is financially supported through a number of sources including Science Foundation Principal Investigator Programme, Enterprise Ireland, The Higher Education Authority (PRTLI) and the European Union. Tia’s research interests lie in the fields of molecular spectroscopy & photophysics and in supramolecular & interfacial chemistry. She is particularly interested in applications of these fields to biological problems, including cell imaging/environmental mapping, cell capture, sensing and membrane mimetics. In the context of water, Tia’s interests lie in sensing and in the development of novel interfacial materials for solar remediation of waste water.